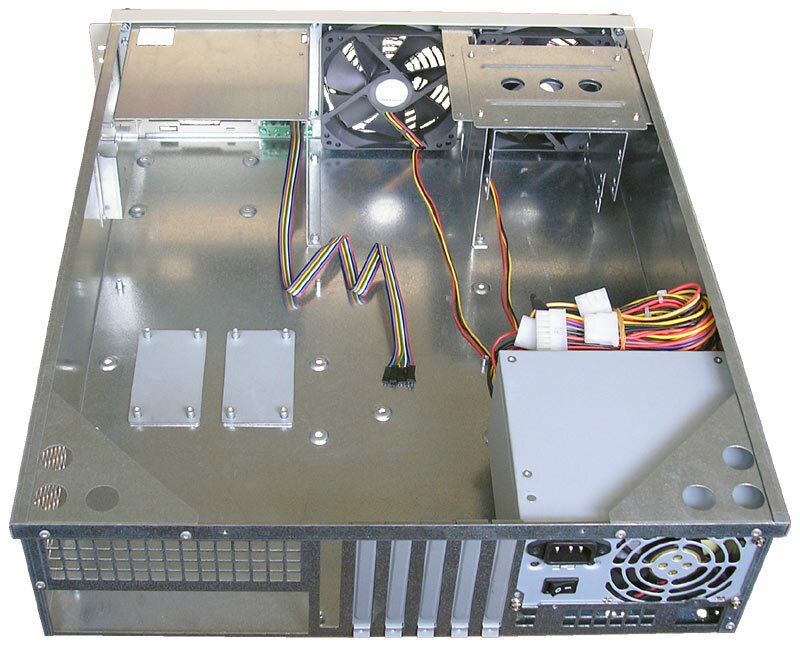 There are two form factors of PSUs you can place in the chassis: 1) - regular 140х150х86mm, wide-used in PC and pedestal server, 2) - compact 198х122х85mm, used in rackmount 2U chassis manufactured by InPC. 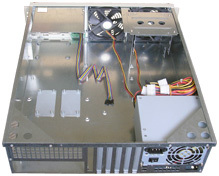 The D34 chassis allows to use up to 5 expansion slots of full height if a regular PSU has been installed. 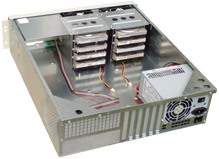 If the compact 2U PSU has been installed then 7 expansion slots can be used. You decide what type of PSU to use yourself, the chassis stays the same. 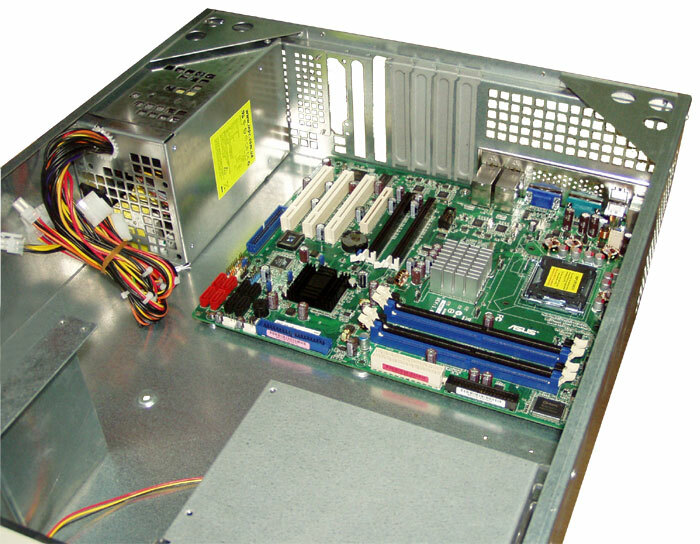 The following Application Note describes the mechanical specification of the D34 chassis, especially accessibility to expansion slots and as following an ability of I/O card installation that is depended on the main factor - what type of PSU has been selected. D34 has 7 expansion slots on its back side where I/O cards can be installed. 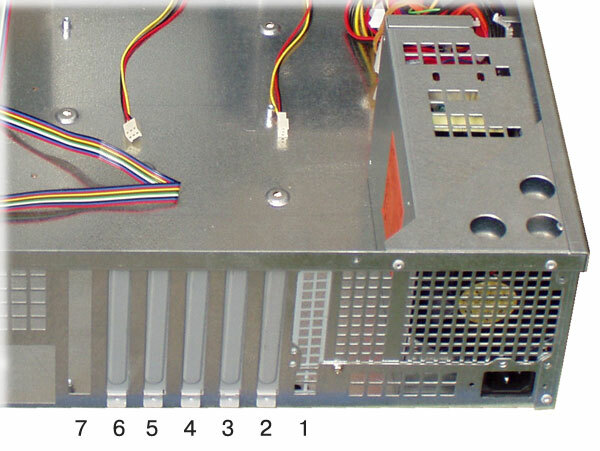 However, only 5 of 7 expansion slots can be used if a regular (140х150х86mm) PSU has been installed. 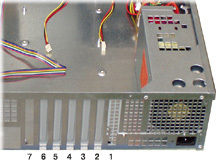 Picture at the left shows the situation when slot-1 and slot-2 cannot be used because of they have been hidden by PSU. 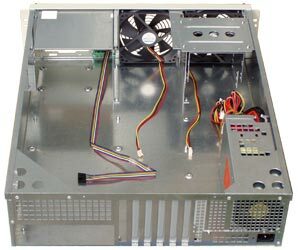 Regular PSU is wide-used in PC and pedestal server and has lower price in comparision with another special designed one. 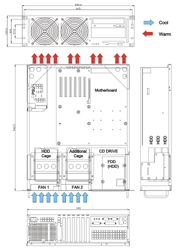 So, if your system does not use slot-1 or slot-2 it is reasonable to complete the D34 with regular PSU. 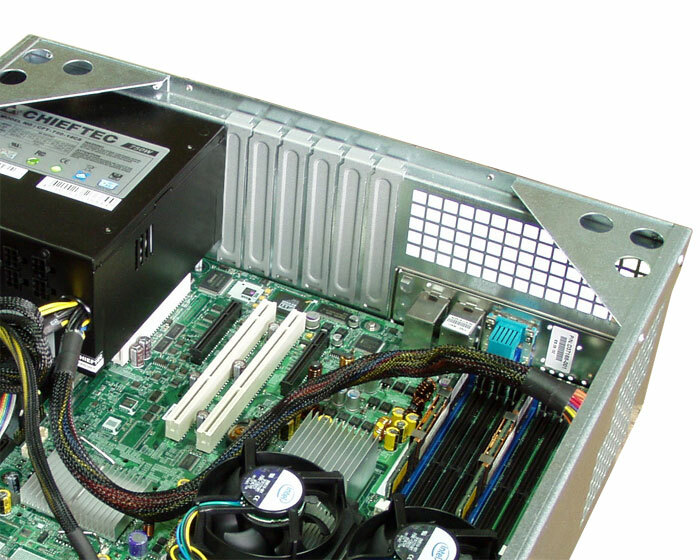 For example, your system has to be powered 400W PSU and does not use neither slot-1 nor slot-2. In this case you can order the D34400 chassis (D34 with 400W PSU) or the D34 (without any PSU and install PSU yourself). 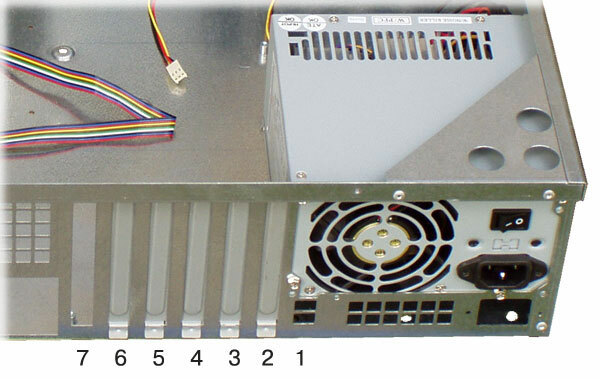 If a system has to use these slots then compact (198х122х85mm) 2U PSU should be installed (as shown on the picture below on the left). 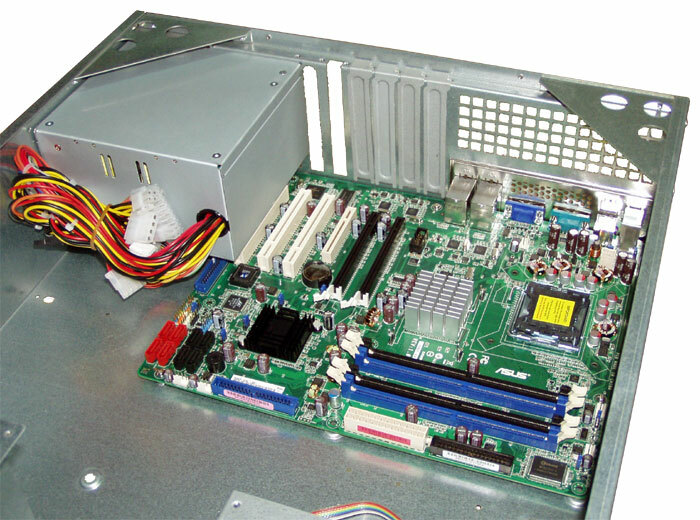 Otherwise, if your system uses either slot-1 or slot-2 you should order the D34A400 chassis. Keep in mind that compact (198х122х85mm) 2U PSU manufactured by InPC has uniqu mechanical specification and cannot be replaced by another 2U PSU. Compact (198х122х85mm) 2U InPC PSU can be ordered separately, but it is advisable to order chassis together with required PSU. The chassis can be equipped additional cage 4HD34M. To realise it the chassis should not be modified or equipped by extra clamps. 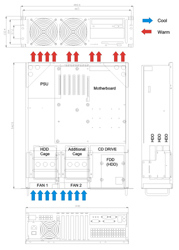 The 4HD34M cage is supplied as option. It is advisable to order the cage together with chassis. The DR-3U-500 Slide Rail Kit is supplied together with the D34 chassis. Remove the D34 chassis from the packaging box and check that the Kit is included. The Kit consists of two symmetric Holders - left and right. Each Holder consists of two parts - Front Bracket and Back Bracket. Slide together the front to back sections of the Holders as shown on the picture on the left. Extend the Holders to the length required to fit the rack or cabinet before you install it. Notify, there are two variants to join Back Bracket (A and B). Screw on appropriate nuts (supplied with the Kit) to each bracket, and tighten the front and the back sections. Install 12 cage nuts in the rack (not supplied with the Kit). Note! Please make sure the salient side of each Holder (left and right) is in the opposite position in the rackmount. Reffer to the picture on the left. You should install 6 cage nuts (red marked) and tighten the both Holders with 4 appropriate screws for EACH SIDE of the rack (left and right, front and back). You need to tighten 8 screws total. Slide the D34 based system along the pre-installed Holders in the suitable rack. Tighten the other 4 screws on the opposite side of the front panel where it attaches to the rack.